Miriam Lapp returns to the Amish community she once belonged to when she hears of her mother's death. Amidst her grief and some painful lies from her past, she is forced to face the people who rejected her. Losing her once fiance and being shunned by her father becomes an excruciating test of her faith. 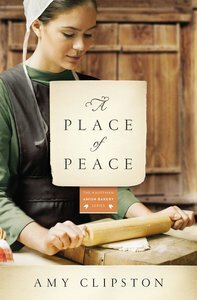 About "A Place of Peace (#03 in Kauffman Amish Bakery Series)"
Take a trip to Bird-in-Hand, Pennsylvania, where you'll meet the women of the Kauffman Amish Bakery in Lancaster County. As each woman's story unfolds, you will share in her heartaches, trials, joys, dreams ? and secrets. You'll discover how the simplicity of the Amish lifestyle can clash with the ?English? way of life?and the decisions and consequences that follow. Most importantly, you will be encouraged by the hope and faith of these women, and the importance they place on their families. Miriam Lapp, who left the Amish community of Bird-in-Hand three years ago, is heartbroken when her sister calls to reveal that her mother has died suddenly. Traveling home to Pennsylvania, she is forced to face the heartache from her past, including her rift from her family and the breakup of her engagement with Timothy Kauffman. Her past emotional wounds are reopened when her family rejects her once again and she finds out that Timothy is in a relationship with someone else. Miriam discovers that the rumors that broke them up three years ago were all lies. However, when Timothy proposes to his girlfriend and Miriam's father disowns her, Miriam returns to Indiana with her heart in shambles. When Miriam's father has a stroke, Miriam returns to Pennsylvania, where her world continues to fall apart, leaving her to question her place in the Amish community and her faith in God.